GHR (Growth Hormone Releaser) is a special combination of amino acids and colostrum that are important for the growth and development of children. The amino acids are beneficial for releasing growth hormones, which aid in muscle development and fat metabolism. COlostrum is rich in immune and growth factors, such as Insulin-like Growth Factor1 (IGF-1) that may be useful for stimulating muscle growth. L-Arginine 75mg, L-Ornithine 50mg, L-Histidine 25mg, Colostrum 20mg,Calcium (Chelate) 5mg, L-Tryptophan 5mg.This product contains tableting aids and coating colour. The study of human growth is known as auxology. Growth and height have long been recognized as a measure of the health and wellness of individuals, hence part of the reasoning for the use of growth charts. Height extremes of either excessive tallness or shortness can cause social exclusion and discrimination. An individual’s height can be largely a part of what social clique, or group that they fall in to. This is usually associated with pre-teens and teenagers. There is also a strong correlation between subnormal stature and individual’s self-esteem. There are two factors in determining the human height, genetics and environmental factors. Genetic factors cannot be altered, while environmental factors can. These include diet or nutrition, exercise, fitness, pollution exposure, sleep patterns, climate, and even happiness, which is associated with an individual’s psychological well-being. Another aspect is the human growth hormone that can also affect the growth and final height. In adolescents, the hormone secretion occurs in highest amount during sleep and it can be enhanced by exercise. If not enough growth hormone is secreted by the pituitary gland, then the child needs medical attention to find out if there is a deficiency in growth hormone and appropriate treatment will be given. 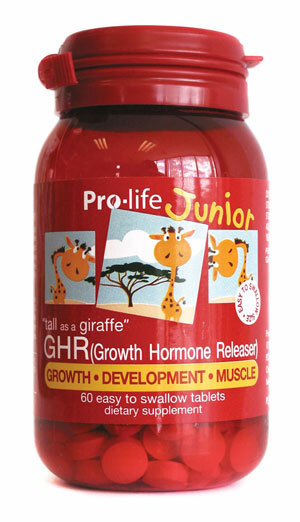 Prolife has designed a special formulation called GHR (Growth Hormone Releaser). It is a combination of amino acids and colostrum that are important for the growth and development of children. Amino acids are building blocks of proteins and GHR contains arginine, ornithine, histidine and tryptophan. Calcium, an essential mineral for healthy bones and teeth, is also included in this formulation. Arginine is a non-essential amino acid, meaning that it can be manufactured by the human body. It is commonly found in dairy, meat and poultry, fish, nuts and chocolate. Arginine plays an important role in cell division, the healing of wounds, removing ammonia from the body, immune function, and the release of several hormones, including growth hormone and insulin. Of the amino acids, arginine is the most potent growth hormone secretagogue in human. It potentiates the growth hormone response to growth hormone releasing hormone (GHRH), exerts a weaker prolactin-releasing effect, stimulates insulin and glucagons, and induces a biphasic glucose variation. Bellone J., Valetto M.R. et al studied the effects of the infusion of several amino acids on basal and GHRH-stimulated growth hormone secretion and on prolactin, insulin and glucose levels and compared with those of arginine in 43 children with normal short stature. Arginine increased basal and GHRH-stimulated growth hormone levels. High dose of arginine increased both prolactin and insulin levels more than low dose of arginine, while glucose levels showed a similar increase followed by a similar decrease. This study shows that arginine has the highest stimulatory effect on pituitary and pancreatic hormones in childhood. In West Germany, a study was carried out to determine how arginine stimulated growth hormone secretion. It was found that the stimulatory effects of arginine were mediated by suppression of the secretion of endogenous somatostatin, which is also known as growth hormone inhibiting hormone. Ornithine is an amino acid manufactured by the body when arginine is metabolised during the production of urea. Therefore, ornithine is a central part of the urea cycle, which allows for the disposal of excess nitrogen. With its main use in arginine biosynthesis, ornithine acts as an intermediate in metabolic processes. An ornithine infusion trial was performed in fifty-four children with constitutional short stature. It induced an elevated level of growth hormone and a similar rise of cortisol levels. This trial suggested that ornithine infusion allowed simultaneous study of the pituitary secretions in children with delayed growth. And this finding also showed that ornithine might have an influence on the function of pituitary gland and growth hormone levels in short children. Histidine is one of the 20 most common natural amino acids present in proteins. In humans, histidine is considered as a semi-essential amino acid because adults generally produce adequate amounts but children may not. It is also a precursor of histamine, a compound released by immune system cells during an allergic reaction. Three US researchers from Department of Pediatrics at Cornell University Medical College investigated the genetic defects in the control of growth hormone secretion. The growth hormone deficiency (GHD) causes short stature and metabolic derangements. They found that GHD is more commonly caused by recessive or dominant mutations of the growth hormone gene. In a large kindred with dominant GHD they found a heterozygous mutation replacing of arginine with histidine. Therefore, these researchers speculated that the introduced histidine might interfere with the interactions necessary for correct growth hormone secretion. Tryptophan is an essential amino acid in the human diet and is found particularly plentiful in chocolate, oats, bananas, mangoes, dried dates, dairy, red meat, eggs, fish, poultry, sesame, chickpeas, sunflower seeds, pumpkin seeds and peanuts. Beside functioning in protein biosynthesis like the rest of the amino acids, tryptophan also acts as a biochemical precursor for serotonin, a neurotransmitter that plays important roles in sleep, emotional moods, pain control and other body functions. Niacin, vitamin B3, is also synthesized from tryptophan. Charney D.S et al studied the effect of intravenous tryptophan on the central nervous system serotonergic function in ten healthy subjects. The effects of growth hormone, prolactin and mood were assessed. In all ten subjects, the tryptophan infusion induced a significant increase in growth hormone concentration and robust increases in prolactin. The subjects reported feeling significantly higher, mellow and drowsy following the tryptophan infusion in comparison to placebo. These findings indicate an important role for serotonin in growth hormone and prolactin secretion, as well as in mood regulation. Hence, growing children taking tryptophan may gain the benefits of enhanced hormone secretion and improved their mood, as well as other serotonergic functions. Colostrum is one of the nature’s nutrient-dense foods. It is a form of pre-milk fluid produced by the mammary glands of the cows during the first 48 hours after giving birth. It contains high levels of antibodies called “secretory immunoglobulins” that protect the newborns from harmful viruses and bacteria. Colostrum is also a rich source of growth factor, such as Insulin-like Growth Factor-1 (IGF-1), a polypeptide protein hormone that plays an important role in childhood growth and continues to have anabolic effects in adults. IGF-1 is essential for regulating cell growth and development, as well as cellular DNA synthesis. In Sweden, the measurements of serum levels of IGFs were carried out in 39 constitutionally short children and adolescents and compared with those of 27 age-matched normal subjects. The mean serum levels of IGF-1 were found to be lower in short children compared to normal, pre-pubertal children. The results suggest that growth retardation in short children involves IGF-1 deficiency resulting from decreased IGF-1 synthesis and its reduced bioavailability. Therefore, short children may benefit from supplementing colostrum that naturally contains IGF-1. Calcium is the most abundant, essential mineral in the human body. This mineral is needed to form bones and teeth and is also required for blood clotting, blood pressure regulation, transmission of signals in nerve cells, and muscle contraction. In Denmark, a randomised, double-blinded, placebo-controlled study was undertaken to evaluate the effect of calcium supplementation on bone mineral accumulation. Sixty girls were selected to receive calcium or placebo for 1 year. Whole-body bone mineral content, bone area, bone mineral density, bone mineral content adjusted for bone area, height and weight (or size adjusted bone mineral content) were measured before and after the study. The result showed modest effect on calcium supplementation on bone mineral density and size adjusted bone mineral content. Hence it is helpful for growing children to supplement with calcium. In summary, GHR (Growth Hormone Releaser) is an amino acid formulation that was designed to stimulate the production of growth hormones in the body. GHR also contains calcium, and colostrum that is rich in growth factors. It is important for parents to help their children to obtain proper nutritious diet, exercise more (or be more active), have a good sleep pattern and maintain a happy mood. GHR is a useful supplement for short children, especially before and during their puberty period.